The demolition of Cicurel Villa in Egypt's second capital made headlines recently. Ahram Online delves into the history of the lost architectural gem in a city that was once famous for its cosmopolitanism. Just a few steps away from Roushdy Tram Station, on the pavement in Abu Qir Street, my eyes spot the bulldozer that is knocking down one of the oldest villas in the neighbourhood. And not just any villa either. Cicurel Villa, for pity’s sake. Cicurel is a name that often comes up when parents and grandparents take their children down memory lane, to an Egypt you never really knew. "Cicurel" is a lavish department store. Along with names like Chemla, Gattegno, Ades, Levi-Benzion, Orosdi-Back, Simon-Arzt, Chalons, Cohenca, Morums, Salon Vert, Carnaval de Venise, Pontremoli, Rivoli, Hannaux — some dating back to 1882 — such stores were the venues of the latest fashions and a face of cosmopolitan Egypt. However, what has made Cicurel Villa special to all Alexandrians is the history encapsulated within its fine walls and gilded ceilings; the history of Alexandria as a centre of diversity and culture. The villa dates back to 1930, built within the remit of French architectural practice in art deco and artistic style, an eclectic artistic design that flourished throughout the 1930s and was well known for its multinational, neoclassical, constructivist, cubist, influences. It also drew inspiration from ancient Egyptian and Aztec forms. As it embodies all these styles, the family Cicurel family was an example of Alexandria's cosmopolitan character where multiethnic and multi-national groups — Armenians, Jews, Greeks, Italians — came together. According to Salvator Cicurel by Lambert M Surhone, and The Man in the White Sharkskin Suit: A Jewish Family's Exodus from Old Cairo to the New World by Lucette Lagnado, Morneo Cicurel, a Jewish Sephardic Ladino-speaking Turkish merchant, came to Egypt in the late 19th century. He worked in a textile shop in Mosuky owned by Hannaux, another high-flying store. In 1910, Cicurel inaugurated "Au Petit Bazar" next to Chemla Freres, one of most distinguished department stores at the time. 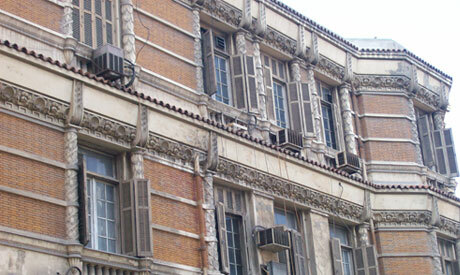 In no time, Au Petit Bazar met with great success and attracted many of the highest elite classes in Cairo. Widening his stores in Cairo and Alexandria, by the end of World War I, Cicurel became a pillar of commercial and financial clout and commissioned Armenian architect Garo Balian to build him a giant emporium which should compete in grandness with the neighbouring Chemla. Cicurel's huge stores contained everything. One could buy there anything you could want: clothes, cosmetics, fabrics, glass. Many high society ladies were prepared entirely at Cicurel. Cicurel didn't stop at that but exceeded all commercial boundaries by opening several ventures like Au Reve des Dames, a haberdashery and ladies wear store. Salvator Cicurel, one of Morneo's three sons, presided over the Cairo Jewish community in 1946 as the last president of the community in Egypt. As head of the Egyptian Chamber of Commerce, he was also known for being a lover of sports and a champion fencer and golfer. In 1928, he led the Egyptian fencing team at the Olympics held in Amsterdam. Nonetheless, as everything comes to an end, the family had to leave Egypt. Under the Nasser regime, the tide turned, especially after Palestine War in 1948. Nasser’s evacuation of Egypt’s Jews, argues Joel Beinin in his book The Dispersion of Egyptian Jewry, was borne from the embedding within Egyptian society of a large spy network from 1945, prior to Israel’s establishment as a state. Like the rest of their counterparts, the Cicurel's travelled to Europe in 1957. Subsequently, in 1961, Grands Magasins Cicurel was nationalised. "The minute Cicurel Villa witnesses its fatal end, we are all doomed," is a sentiment often heard uttered by Alexandrians witnessing the heartless end of one of Egypt's historic artistic buildings. Outrage is spreading on social media networks. "It is estimated that more than 50 historic palaces and villas in only Roushdy, Kafr Abdou and Zizynia districts have been bulldozed in the past 14 months," explained Abdel Haleem Nour El Deen, ex-treasurer of the Supreme Council of Antiques and head of the Egyptian Architecture Society. Despite all calls and marches in Alexandria against the demolition action (including the creation of a Facebook page called "We won't let Alexandria come into ruins") Decree No 86 was issued by Kamal El-Ganzoury to remove Cicurel Villa from the list of "must be preserved" heritage sites in the city. It is devastating to see our historic and fine architecture decimated in less than 15 months. WHAT EXTRAORDINARY ALEXANDRIA WAS ! I WAS BORN THERE AND LEFT IN 1957! egypt now makes me puke!!! I am glad I don't live there any more. It would be too painful! I am surprised not to see the Sednaoui stores among those mentioned in the article, although we were at least as important as Cicurel. We had a villa also in Rouchdy Alexandria, that we sold and has been demolished. PART OF THE EGYPTIAN HERITAGE I GOT ,WHERE I WAS BORN AND GREW. A PITY FOR THE LOST HISTORY THIS ITEM REVEALS. While I can understand the feelings of all those people who appreciate the old architectural treasures of a gone by era in Egypt and lament the good old days in that beautiful and unforgetable country. They have to understand that they are still imagining an Egypt of 16 to 23 million people and not the Egypt that is now close to four times that number. Therefore, they need every inch of space to accommodate the ever increasing population. Accordingly a multistory building will -at least according to the planner- be more useful. Just wondering whether Mr Goubran would like to also get rid of the Pyramids and sphinx to make more room for more multistory buildings. It is so sad to see our beautiful and beloved Alexandria destroyed infront of our very eyes and there is nothing anyone can do about it once again because the majority of people living there now do not value such important heritage. For alas, the people who care are no longer there !! A very poweful aricle with a well historic background...We feel very sad and dissappointed that such screams and cries hat such historic villas are being destroyed infront of us and noone an do anuthing to save our heritage! !